We make all stud earrings by ourselves. Pearls of various diameters and colors were previously steamed in China by breeders. In our shop we choose pin with appropriate size for specific pearls. All elements are made from silver 925. The variety of natural colors and greatness create a rich collection. For gluing, we use the best jewellery glue which is available on the Polish market. PRODUCT DESCRIPTION:Pearls: natural - cultured, freshwater;Silver: 925Weight of earrings: 2.37-2.5 g.. PRODUCT DESCRIPTION:Pearls: natural - cultured, freshwater;Silver: 925Weight of earrings: 3.7-3.8 gC.. Hanging earringsSilver: 925 trialWeight of earrings: 3 g .; length of earrings: 4.5 cm.Description o.. Description of pearls: natural breeding, freshwater; color: opalescent brown with a purple glow;diam.. PRODUCT DESCRIPTION:Pearls: natural - cultured, freshwater;Silver: 925Weight of earrings: 2.9-3.1 gC.. 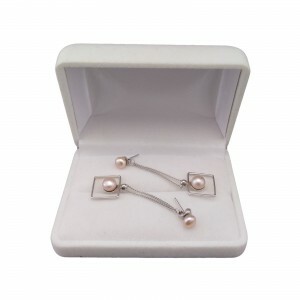 PRODUCT DESCRIPTION:Pearls: natural - cultured, freshwater;Silver: 925The weight of earrings: 1.09-1.. PRODUCT DESCRIPTION:Pearls: natural - cultured, freshwater;Silver: 925Weight of earrings: 0.84-0.9 g.. Hanging earrings made of natural freshwater pearls. Pearls in the shape of a delicate tear, with a b.. PRODUCT DESCRIPTION:Pearls: natural - cultured, freshwater;Silver: 925Weight of earrings: 2.9-3.1 gT.. Description of pearls: natural breeding, freshwater; color: white and cream; pearl size: 11.6 mmStea.. Hanging earrings made of faceted agates. Agates with a beautiful red and blue color shimmering in th..